A FUNDRAISING campaign to help raise cash for Syrian refugees has been launched on the Antrim Road. 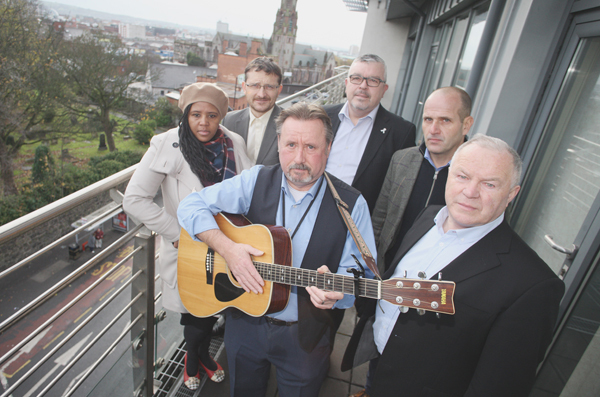 ‘Humanity’, written by Davy Kettyles, will be available for download from this week with the organisers aiming to top the download charts in Belfast. Davy wrote the song following the harrowing pictures of the young Syrian refugee Aylan Kurdi, who drowned off the Turkish coast in 2015 after trying to make his way to safety in Europe. The release is being sponsored by the union Unite who hosted the launch with proceeds going to Save the Children. “I was powerfully moved by the death of little Aylan and by the plight of so many people who have been forced to leave their homes because of war,” he said. “I made this song in the hope of challenging the prejudice that exists to the migrants who are seeking refuge here and to encourage people to give something to help those caught in this tragedy. It’s important to capture the plight of ordinary people fleeing their homes in search of sanctuary, to illustrate the truly awful things that have happened on that journey.